"Practice indoor flying and close-quarter combat skills with this free playable demo. Fight with AI bots to control checkpoints in the Warehouse map. 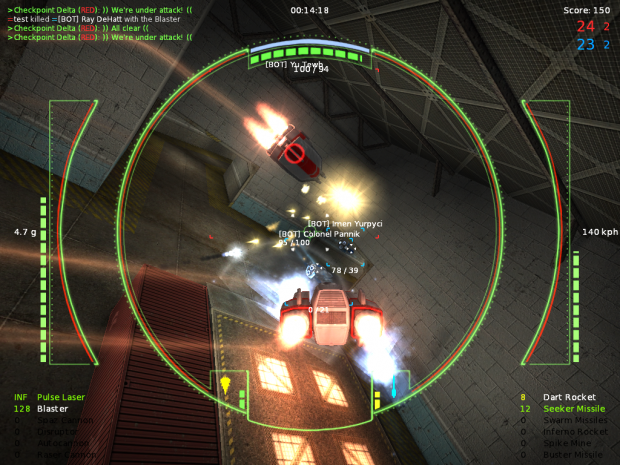 Demo contains one map, one ship, and a full arsenal of weapons. Demo does not support multiplayer. Note: the demo defaults to the lowest AI skill setting, which you can turn up once you are ready for a greater challenge." "Free Demo coming and Early Access sales begin soon! Stay tuned for further details." I know; it's fixed now. I have many sites to update, posts to make. I can only work so fast. Have you thought of putting this on torrents? Honestly, no, I haven't thought of that. It is a good idea, but I'm not set up for that, and I know very little about torrents. I've never offered a torrent but I'm sure it wouldn't be hard. If you want I could try it with the demo. I can do it for you but I don't think its a good idea personally. Once this game shows up to that crowd, its only a matter of days before the full version ends up on there too. Hmm. Well that does give me pause. If your game is popular, nothing will stop them from hacking it but because it's new and indie, then I highly doubt it will be a risk but the ultimate decision is yours. True that, I just feel like torrent users are largely just a bunch of pirates. I mean seriously, besides game companies using as a way to offer insane download speeds for 15-30 gb games, what has anybody used torrents for besides illegal stuff? How would a torrent-based distribution be benefitial ? You would choose torrent if you expect hundreds of downloads every minute and you would need to offer several hundreds of megabytes. Pirating the software is a different problem completely independent of torrents. I just thought torrent could potentially offer more advertising. It would be beneficial if it provides exposure, another route by which people might find the demo. I honestly don't know if that would be the case here, owing to my lack of experience with torrents. edit: Advertising, as Merlin said. Now, will putting the demo on torrents allow people to find it if they aren't already looking for it? Putting it on torrents would make more people see it for sure. Right now only Descent fans know about this game because it's more geared to us. Advertising on FB is one thing but most of us don't use FB for finding games. That is done through game sites usually.